Fission reactions can happen spontaneously or when triggered by outside events. Spontaneous fission is a type of radioactive decay beyond alpha, beta, and gamma, and is only seen naturally in the very heaviest elements. Observable spontaneous fission (occurring on time scales shorter than the age of the universe) happens only if an element has 232 neutrons and protons (A=232) or more. For all natural elements except uranium and plutonium, spontaneous fission is so exceedingly rare that it is unimportant and almost impossible to detect. When building a nuclear device, however, the possibility of spontaneous fission must be accounted for. During a spontaneous emission, the nucleus divides into two smaller parts, and ejects several neutrons. These ejected neutrons can begin a fission chain reaction (I'll explain below), essentially starting the reactor or bomb prematurely! Thus, nuclear devices cannot be built with atoms that are too large, because their fission reaction can be kick-started accidentally by spontaneous fission! The second type of fission reaction is caused by external bombardment. Humans control this type of fission to produce nuclear energy. When an atom like U-238 is hit by a neutron (not repelled by the electromagnetic force since it is neutral) with enough speed, the nucleus will absorb it. The incoming neutron needs this immense speed to have enough energy to overcome the grip of the strong force keeping the nucleus spherical (or ellipsoidal, or even pear-shaped). When the nucleus absorbs that energy, it is stretched and deformed, becoming peanut-shaped. Once the two lobes of the peanut are separated by enough distance the hold of the nuclear strong force weakens, and electromagnetic repulsion between their positive charges forces them to split apart entirely. As the split occurs, two things are released from the nucleus: neutrons and a large amount of energy. In Uranium fission, roughly .1% of the mass of the nucleus is converted directly to energy (E=mc2). The total energy released per fission reaction is millions of times greater than the burning of the same mass of chemical fuel or explosives. A 500-1000 Megawatt coal-fired plant burns more than ten million pounds of coal every day, while a nuclear reactor produces the same steady power every day from less than 100 pounds of Uranium. Every day, coal plants burn roughly 100, 000 times more fuel (by mass) than nuclear reactors! A fission reactor's design is tailored to control the exact number of neutrons moving through a core area of uranium to keep fission reactions happening at a steady, controlled rate. The fission of one nucleus must produce enough neutrons that exactly one of the neutrons produced can fission with another nucleus, while all others will fail to do so. If 50% of neutrons produced set off another fission, then two neutrons must be produced in each fission. The design of a nuclear bomb, however, is centered around creating as many neutrons as possible during each fission and reflecting them back into the material. 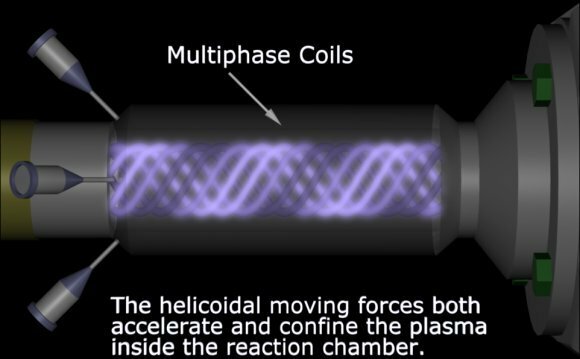 This creates a runaway chain of fission giving off more energy. If five neutrons are produced by each fission, and four of them are successfully reflected to create new fission reactions, one nucleus will set off four more atoms, which fission sixteen, which fission 64, etc. An extraordinary number of fission chain reactions fire in a fraction of a second, giving off an enormous amount of energy. Both designs are highly complex, but have been well understood by physicists and nuclear engineers for decades. Does nuclear power seem frightening? Nuclear reactors are actually less scary than you imagine - they form naturally right under our feet! Pockets of Uranium in the earth's crust can form their own completely natural uranium nuclear reactors! Gabon, a small nation on the Atlantic coast of Africa, is home to a group of these sites, located in a region called Oklo. Nuclear fission is the most powerful process yet harnessed by humans, and it will remain so until nuclear fusion is perfected. Distinct, acute possibilities for danger and destruction accompany its use. As a properly and judiciously wielded tool, however, it delivers energy at a rate that is otherwise unimaginable.